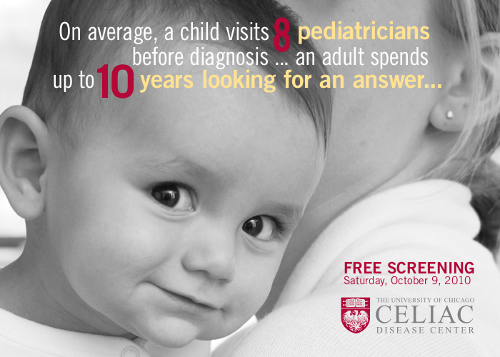 The University of Chicago Celiac Disease Center will hold another free Celiac Disease blood screening on Saturday, October 9, 2010. In addition to screening 500+ people for Celiac Disease–thanks to the generosity of Prometheus Laboratories–their panel of experts will take questions from the audience and exhibitors will showcase delicious gluten free products. 1 in 100 people in the United States have Celiac disease, but 97% of those remain undiagnosed. If the screening is full, please schedule a visit with your doctor and ask him to screen you for Celiac disease. A gluten-free care package for newly diagnosed Celiac patients. The University of Chicago Celiac Disease Center is a huge asset to the Celiac community. Thanks to all of those who are part of this outstanding medical center.